From time to time, we’re lucky enough that our awesome readers randomly share gems such as these with 1967beetle.com. Very nice. I mean, NICER! 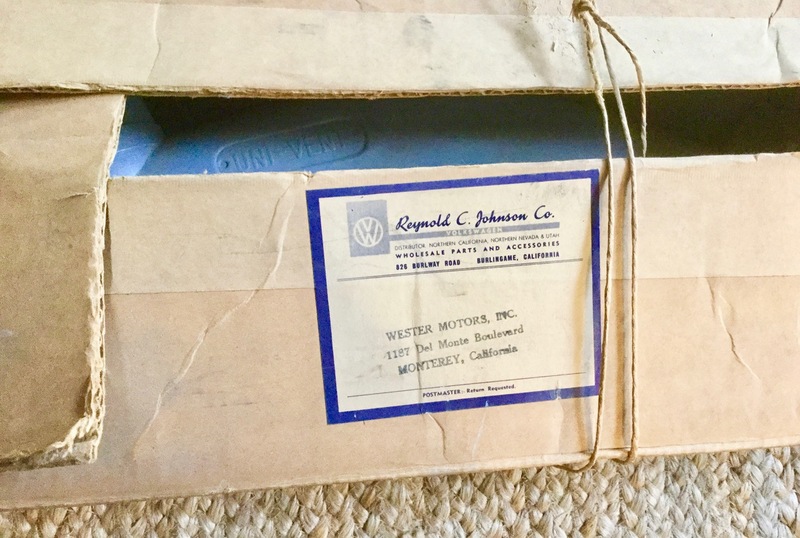 Thanks to Don Hooper for sending this interesting piece of vintage VW history our way. 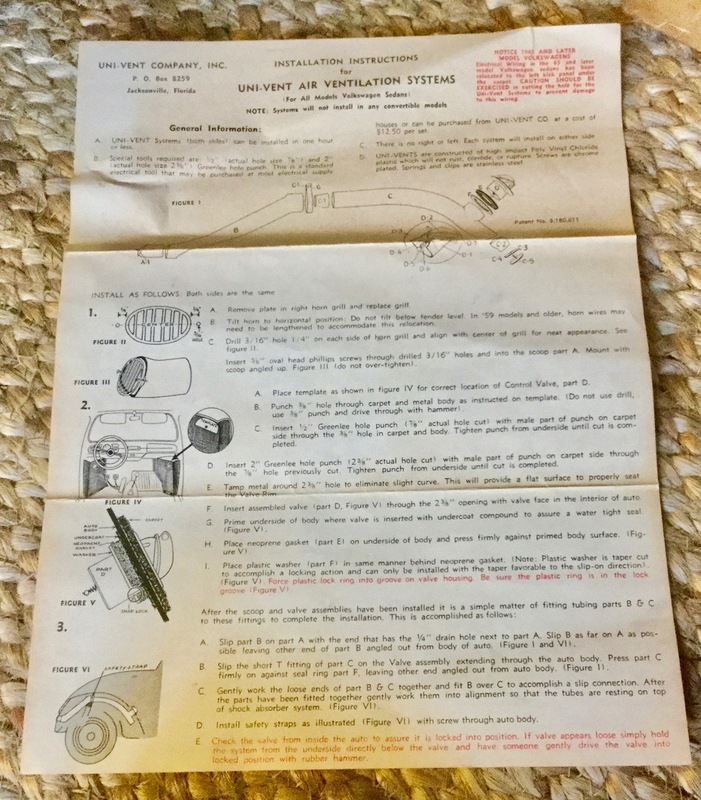 Now that I have spread the word amongst the 1967 Beetle community about my 40 year affair with my 67 Beetle Type 151 Cabriolet, I thought maybe some would enjoy looking at some parts I bought years ago. I wonder how many here were aware that an in-cabin fresh air ventilation system was available for their 1967 Beetle? 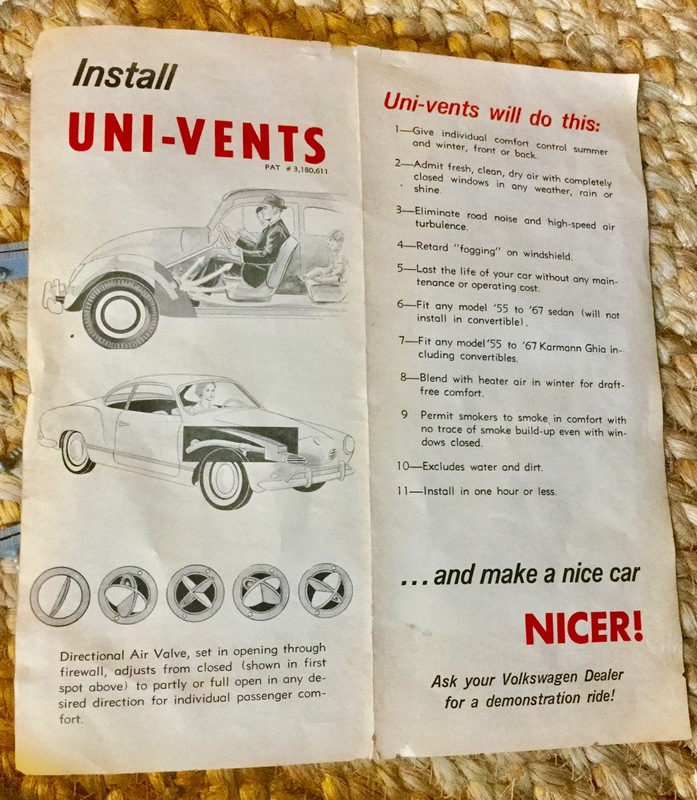 Well, it was available as an aftermarket, owner or dealer installed accessory know as the Uni-Vent Air Ventilation System. 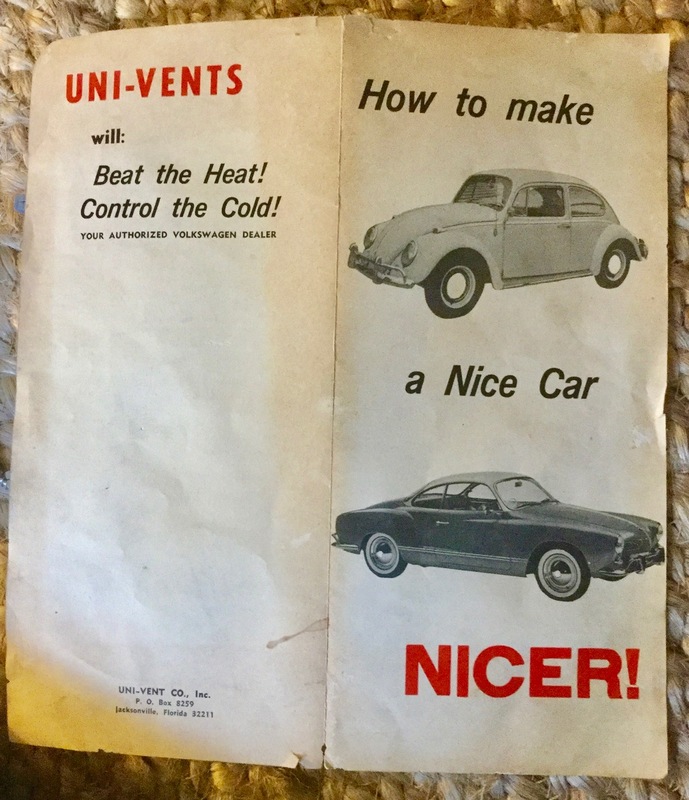 Produced by Uni-Vent Co. Inc. of Jacksonville FL and sold by authorized VW dealers, the kit included a plastic tubular vent pipe system with scoops for each horn grill, that routed up inside the inner fenders to 2” holes punched into the kick panels on sedans and Karmann Ghias. Two round vents units with spring loaded rotating caps closed the system or allowed for air to be directed up, down or sideways in the foot wheels. The assembly was not made to fit the unique convertible kick panel shape. 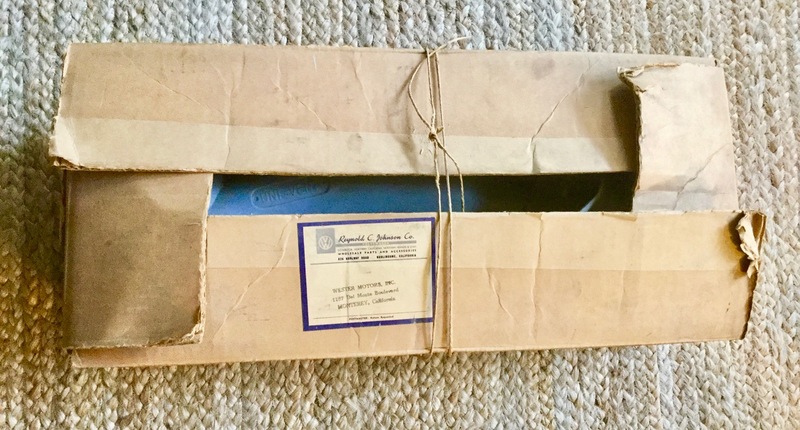 I bought my NOS set from Bob Scott at Vintage Parts in Glendale, CA in January 1985 for $80 plus tax, intending to install it in my daily driver 1967 Lotus White sedan. My plan was to make my daily 40 mile drive on Los Angeles Freeways through hot summer months more tolerable. I know from the literature included that the set was extremely effective and would have made a big difference in my drives, but I never got around to doing the installation before I sold the car. Hence the set has sat on a shelf in my garage for the last 32 years. I thought it might be enjoyable for others who actually drove their 1967 beetles daily to travel back in time through this story and these pictures and remember sweltering days puttering along in the slow lane in the San Fernando Valley or elsewhere in obsessive heat. What a joy those days were! Wow… this would have bin one of the greatest added beetle gizmos of all time. Even in the north ! Something I have never seen before. Well now… that’s a great question…. but it seems he has had, or has been around just about every other part, or trinket. 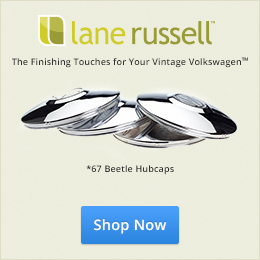 How is your cherished beetle ? I very much liked your story. Lol…… I knew Jay would have experience on this hidden treasure. Good stuff, everyone. I too knew that JK had probably had a few. We have this in our 65. We purchased it from the original owner. Theirs was installed when they purchased the bug from the dealer. Found it on there invoice for 24.95. We love that they had this added back then. Use it on every cruise! My 67 Sun Roof has the UniVents and they work great. Roll the windows up, open the pop outs it is nice , so I can actually listen to the Sapphire VI. I, also have an unopened NOS set of UniVents put away. UniVents made for a cheap option which work great. WOW! Learn something every day. That is why I love this sight. Will send a pix of our 67 Bug and have Eric and Jay critize it. I once saw these on a bug I was scrounging parts off of in a forest, I had no idea what they were! Every time I drive down Victory past Bob’s old shop location I sigh and wish it were still around(I work in Burbank) so I could pick up a part or just look at all the cool stuff he had including that white wrought iron bug that used to sit inside the shop. It’s a bakery now…bummer. I still see his son at the OCTO meet every 6 months. Still has the wide bed single and is still selling mostly repro parts. The shop used to have almost anything you needed, either nos or German made. Sadly those places like his and BFY obsolete in Orange are almost all gone now. Well, I never checked back to see the reaction on 1967Beetle to my Uni-Vents, and I’m happy to see they struck a cord with some of you….. I wish I had a trove of other unique parts to share but unfortunately this is about it. Steve’s comment about Vintage Parts’ Victory Blvd location stirs memories. I bought most things for my convertible at Bob’s very old San Fernando Road Glendale location, but did visit the Victory store once or twice, but after Bob had passed away. I did not know that he was ever there. Located next to the Army Surplus Store as I recall. Do they even have Army/Navy Surplus stores anymore? Now Eric has reported that Bob’s son has also passed away, so don’t look for him at OCTO meets anymore. All good things are disappearing I’m afraid. Wow, this should have been a standard feature!